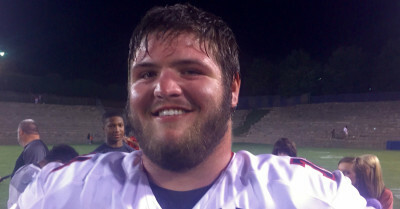 UGA OL commit Ben Cleveland does not mind hunting for his own food. Squirrel — for those of us who haven’t sampled that delicacy — does not taste like chicken. It tastes like squirrel. Imagine that. UGA 4-star OL commitment Ben Cleveland knows all about that. He got hungry for breakfast one morning and didn’t like what was in the fridge or pantry. So he grabbed his gun and shot two squirrels. How did he cook it? How long did it take? Is that why the 6-foot-7 standout can bench press 450 pounds and run a 40-yard dash in under five seconds? Watch the above video for all those answers. But please don’t get caught up thinking Cleveland is “Straight Outta Duck Dynasty” and leave it at that. He’s an excellent student, a humble kid and one of the most respected members of UGA’s 2016 prospect class. Cleveland is set to graduate Stephens County High School early and will enroll in January. UGA fans should love rooting for this guy over the next few years. He’ll be largely responsible for keeping 5-star quarterback Jacob Eason upright during key SEC action and he’s a whole lot of fun in an interview setting. His diet also includes deer jerky. That’s going to be an interesting caloric and protein comparison for UGA’s sports nutrition specialists to track when he’s on campus. Jeff Sentell covers UGA recruiting for AJC.com and The Atlanta Journal-Constitution. Follow him on Twitter for the latest on who’s on their way to play Between the Hedges.